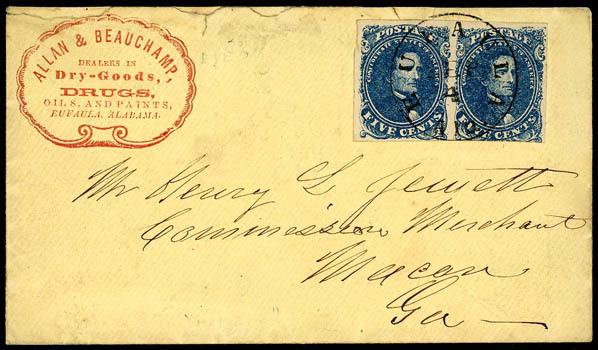 Confederacy, 1862, 5¢ blue, horizontal pair, margins large to just in at bottom right, tied by neat "Eufaula, Ala., Sep 4" cds on cover with red scallop Allan & Beauchamp merchant corner card, to Macon, Ga.; few sealed edge opening tears at top, Very Fine. 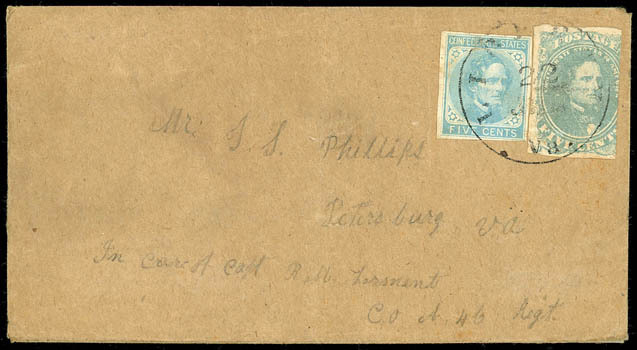 Confederacy, 1862, 5¢ light milky blue, in at right, in combination with 1862, 5¢ light blue, De La Rue printing tied by neat "Liberty, Va., Jul 22" cds on homemade cover to "Mr. J.F. Phillips Petersburg Va In care of Capt. R. M. (?) Co A 46 Regt." on turned cover with hand carried inside use to "Mr. Orren Phillips, Lumberton NC In care of Mr. H. Pitman Jr.", Very Fine. Scott No. 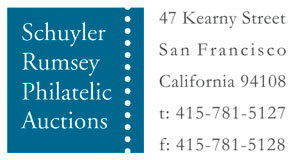 4b+6 Estimate $200 - 300. 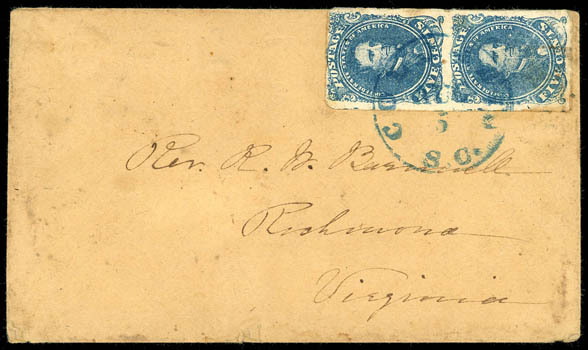 Confederacy, 1862, 5¢ blue, vertical pair, bottom stamp with colorless streak printing variety, tied by neat blue "Columbia, S.C., Aug 5" cds on cover to Rev. R. B. Barnwell in Richmond, Virginia, Very Fine. Scott No. 4 Estimate $150 - 200.